NES Solitaire (any v1.1) in 00:47.27 by mmbossman. April 1st submissions rarely manage to gather overwhelmingly positive user feedback, but this movie is a pleasant exception. 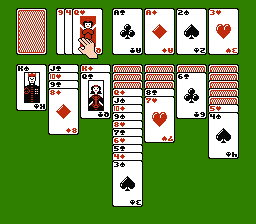 Solitaire is actually a family of single-player card games. The particular form featured on the NES is called Klondike, and you can find it distributed with many desktop operating systems, such as Windows. Amazingly, despite the game being almost as asexual as possible, mmbossman manages to cop a good feel of one of the Queens.